Flowers for Valentine's Day – The Dollar Store Way! If you love shopping at the dollar store even half as much as I do, you may have stood before the tiny bud vases so many of those stores offer thinking, “They’re so cute, but what can I possibly use them for?” Yes – I have eyed up those vases more than my fair share of times. I’m drawn in by their charming tininess, but can never seem to think of a way I can use them, so I walk away well-aware that the last thing my house needs is yet another piece of decor I can’t figure out what to do with! Until now, that is. 1.) Wash and dry the bud vases. 2.) Fill the vases 3/4 to the top with conversation hearts. 3.) Stick a Valentine lollipop or two in the center as ‘flowers’. 4.) Smile – you made an adorable decoration or gift! In addition to the little vases I’ll be placing on my desk, bedside table, shelves and such, I think I’ll also make a larger one to serve as a table centerpiece. And that means I’ll also have to pick up a larger vase while I’m at the dollar store. Oh well – someone’s gotta do it! 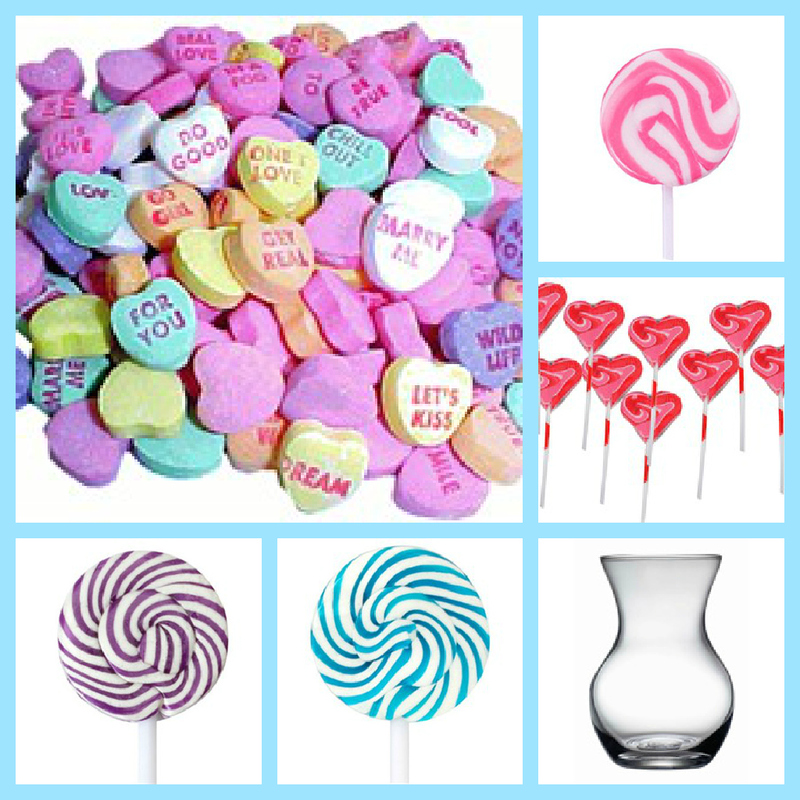 Heart Shaped Lollipops – Share Some Sweetness on a Stick! While Valentine’s Day was once considered a holiday for children and couples alone, in recent years it has grown into a fun and festive time for singles as well. When dining out at a nice restaurant on Valentine’s Day, it is not uncommon to see groups of friends laughing and enjoying each other’s company, adding good times to a good meal. In fact, you might be part of one of those groups! If you’re lucky enough to be one half of a happy couple, good for you! We hope you and your significant sweetheart enjoy a romantic February 14th that’s the best one yet. But if you aren’t involved with anyone at the moment, we hope you’ll consider making exciting plans for Valentine’s Day nonetheless. After all, there are many people in our lives that love us in other ways, and celebrating that love is just as important. While it can get fairly costly to buy flowers and a giant box of chocolates for all your family, friends and coworkers, you can treat them to heart shaped lollipops on the cheap. And unlike flowers, you don’t have to keep them watered – though they can be mouthwatering good! Jolly Rancher Lollipops: These are a great option for kids and adults alike, with space on the wrapper for “To” and “From.” Jolly Ranchers are loved for their fabulously fruity flavor, and these don’t disappoint in Cherry, Apple, Pink Lemonade and Watermelon. With a 5-star review rating and 20 to a bag for less than $4, you can’t go wrong! Charms Lollipops: Is there any cherry flavor so perfect as the cherry flavor from Charms? As someone who doesn’t even count cherry in her Top 3 ‘flavorites’, I choose cherry every time when it’s a Charms lollipop. Luckily, that’s exactly who makes these classic Valentine’s Day lollis, which means if I have a few extras they won’t stand a chance of getting stale! Sweet Swirly Suckers Valentine’s Day Lollipops: These lovely lollipops are larger than most at a generous 3” x 3”! They are decorated with reusable stickers, and make for quite a presentation. If you’re a ‘sucker’ for swirled lollipops, you’re sure to love the look and terrific taste these bring. And be sure to keep one for yourself – you deserve it, darling!